The Call for Paper for next year eMOOCs summit at Graz is now online available. We are asking for research or experience studies concerning the phenomena of Massive Open Online Courses. The deadline for submissions will be the 28th of September 2015. Furthermore also a Institutional and Corporate track will be offered to bring all stakeholders together. Please spread the world, we would love to welcome you next year in Graz. The Emerging Technologies for Learning and Teaching Special Interest Group (SIG) would like to specifically invite innovators, technology-focused, and visionary people of all educational sectors to present and discuss their results with this SIG during EdMedia 2015. The SIG chair encourages researchers to submit contributions with a strong focus on technologyand specifically, proposals should focus onhow technology-enhanced learning can be supported by innovative technologies. For more information and instruction on submitting your proposals, please click the link below. Please find here the [Call For Paper] and here detailed information about the [ED-Media 2015]. I would love to see you in Montreal to discuss new ideas for technologies in education. If you have any question, please do not hesitate to contact me martin[dot]ebner[at]tugraz[dot]at. We are happy to announce a forthcoming workshop on IMMERSIVE VIRTUAL LEARNING ENVIRONMENTS AND ADVANCED (MOBILE) TECHNOLOGIES IN EDUCATION (K-12) within the EiEd 2014 conference, located in Vienna. In general we like to motivate researchers as well as practitioner to join us and submit a paper proposal not later than 30th June 2014. Der Call for Papers für die Jahrestagung der GMW 2014 an der PH Zürich zum Thema „Lernräume gestalten“ ist nun online. Als Mitglied des Steering Committee haben wir versucht die Ausschreibung einerseits sehr breit und andererseits doch fokussiert zu gestalten. Auf was man gespannt sein darf, sind die Möglichkeiten der Präsentationsform der Publikationen vor Ort. Aber dazu erfährt man etwas später an dieser Stelle sicherlich noch mehr. The conference will include four tracks (Policy, Experience, Research and Business), with 5 sessions of 90 minutes and a keynote speaker. EMOOCs 2014 will also offer a series of workshops, meetings and the tutorial “All you need to know about MOOCs”. 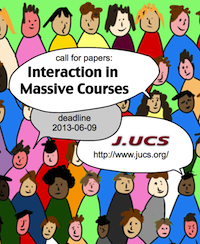 Together with my colleagues from the University of Munich I like to call for submissions on the topic „Interaction in Massive Courses„. The contributions will appear as Special Issue of the journal J.UCS (Journal of Universal Computer Science) which is an open access journal and holds an Impact Factor. 2008) or Social Media (Ebner, 2011) to enhance students’ engagement in live-lecturing-situations. In the last years, the above-mentioned MOOCs attracted the interest of thousands of students. Obviously this leads to new challenges on how to overcome the management of a huge number of occurring interactions and makes new strategies necessary. Assuming that rich interactions in large groups of learners are even more critical in the development of academia this Special Issue of the Journal of Universal Computer Science is dedicated to research on media fostering interaction in massive courses. Here you will find the detailed Call for Paper (CfP).